KCFA’s Ninth Annual Coffee Exposition (the “EXPO”), held at Old Airport Pavilion on Friday, March 18, was a great success. Scheduled for the first time in the month of March, the EXPO again this year provided a highlight event for the coffee-growing community. This year’s EXPO hosted more than 300 attendees—coffee growers, other small farmers, interested residents and visitors alike. There were more than three dozen vendors, non-profits, educational entities and governmental agencies with tables offering information, advice, services and products for farmers. HDOA Deputy Chair Phyllis Shimabukuro-Geiser at EXPO. Shimabukuro-Geiser, gave the keynote address, pledging support for combating CBB and for the marketing of Hawaii-grown coffees. The HDOA was one of two official co-sponsors of the EXPO. 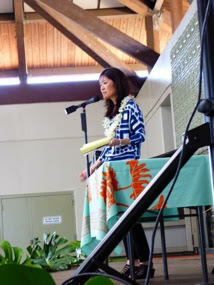 The other co-sponsor was our long-time supporter, Hawaii Community Federal Credit Union. The generous sponsorship from the HDOA and the Credit Union is greatly appreciated. There was a range of well attended workshops and panel presentations addressing topics from CBB research and mitigation techniques to crop insurance, Dengue fever prevention, and farming systems. The day after the event West Hawaii Today ran a large photo spread featuring the EXPO. The EXPO Organizing Committee encourages each of you who attended to send us your thoughts and suggestions for making next year’s “Tenth Annual” EXPO the best in a decade. Also, if you would like to help in organizing next year’s EXPO, let us know and we will add you to the Committee. Send an email to info@konacoffeefarmers.org. Since the newest formulation of Mycotrol means that what you can get is in powder instead of liquid form, and since the available bags are enough for a quart, you are thereby entitled to purchase up to eight (8) bags every 30 days to match the 2-gallon allowance. If any problems with this, state to the staff at Farm & Garden that this is what was told to Colehour Bondera of KCFA by Mike of Farm & Garden on March 21, 2016. Further, regarding the increased prices of Botanigard and Mycotrol, there is no way that Farm & Garden can avoid passing on the price increases that they have received from their suppliers, and therefore those passed on price increases are not from Farm & Garden, but directly reflect the price changes that they have been subjected to at this time…. Please feel free to contact me with any other questions regarding the grant. On Thursday, March 10, 2016, House Concurrent Resolution (HCR) No. 95 was introduced by Representative Nicole Lowen, along with 10 other representatives. The resolution requested the formation of a “working group” to establish a “protocol” for a “study” of the economic impact of “possible changes” to Hawaii’s coffee labeling law—HRS486-120.6. Eight days after its introduction, however, HCR95 was killed by the House Agriculture Committee’s vote to “defer” the measure. BACKGROUND–For years whenever there was even mild interest in the Legislature for addressing reform of the 10% blend law, the blenders and their allies would vigorously argue that nothing should be done until there was a “study” to assess the economic impact on the “Hawaii Coffee Industry”. It was a “delay through study” tactic. However, when bills were introduced to fund a study, the political winds would shift (perhaps at the backroom suggestion of the Honolulu blenders?) and the bills to provide funding for the studies that the blenders said were so necessary would die. What can be listed? Almost anything and it doesn’t need to be solely coffee-related. Specifics: You must be KCFA Member. Maximum length of 500 characters. Include your name/email address/telephone# and the price, if applicable. Send to info@KonaCoffeeFarmers.org with subject: Classifieds. We’ll do the rest asap! Have a headache?? Take acetaminophen and wash it down with coffee. Pain pill will be 40% more effective washed down with coffee. When you hear the sound of hundreds of bees in the orchard you know things are all right in the world. Coffee fruit set and fruit weight can increase up to 25 % through honeybee pollination; that is tenfold for macadamia nuts. 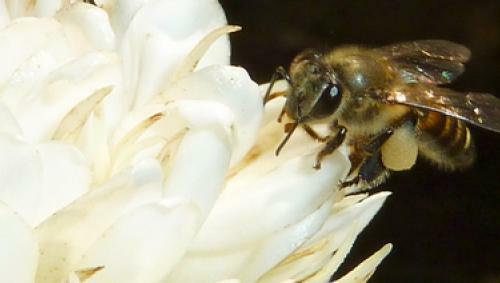 Bees also distribute Beauveria spores, it is known as “bee vectoring”. This along with the many other benefits of pollinators makes them worth our time and any inconvenience. Existing research and development of spore distribution on plants is primarily with bumblebees in greenhouses in Canada but other pollinators probably distribute as well. One can observe what pollinators they do have on their farm and match off season food sources for them. One type does not fit all. Your probably have European honeybees, but also feral bees, hover flies, native bees, bumble bees, flies & other pollinators. Plant unused areas of the farm with temporary cover crops that can provide food, or with a variety of trees, shrubs, and flowers that provide both food and shelter for pollinators. Plants such as Buddleia, Laminacae flowers like lavender & sages, many culinary herbs, Koa, Ohi’a lehua, Naupaka and Ilima to name a few. Many nursery plants have been treated with pesticides that harm bees so ask. Choose non-hybridized types for best nectar sources. ‘Mr. Fungus’ Paul Staments has researched how bees need old growth forest type fungi from rotted logs for overall vigor, health and sustainability. He thinks this is behind their susceptibility to parasites etc. lately. One more reason to protect or old growth forest. Clean water sources are important for hard workers especially when its dry. Bees go through an unbelievable amount of water! They need a shallow dish with rocks as they are poor swimmers. At times your water dish will be covered with bees getting a drink. Nature loves a mess. 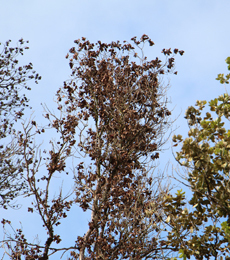 Spare some dead branches, snags, leaf litter as nesting sites for solitary bees, especially leafcutter bees. Leave small areas bare or open ground for ground nesting pollinators, and leave some weeds that provide food for pollinators. My name is Donna Meiners and I have been the Membership chair for about a year. My husband brought me to Kona about three years ago. I live about 4 miles from Honaunau Bay and my most favorite thing is to snorkel at Two-Step. I have attended almost every coffee related class that has been given. I have benefited from advice from our members and our website. If you need to know something about coffee, chances are that it is somewhere within the KCFA website. I think, at this point, I have “met” each of you on paper as I have processed your membership or renewal. The website is so amazing that I only complete some small checks and a tweak but that has kept me quite busy. I do something for KCFA almost every day and am feeling good about being a volunteer. I will be traveling out of the country in April and expect to be on “retreat” without the internet. If you use the website for a renewal, you won’t notice my absence. However, I will not be answering e-mails from April 13- May 3. LET US KNOW WHAT YOU THINK! >> Write us. We welcome Letters to the Editor up to 150 words. We reserve the right to edit for clarity and length. Include your name and email address >> Email: info@KonaCoffeeFarmers.org with SUBJECT: Commentary. What is Kona Worth 2018?